Transvaginal Mesh Lawsuits and Complications – Do You Have a Case? Transvaginal mesh is a medical device that has caused endless problems for female patients. Many of the implants have resulted in terrible health issues like erosion, infection, organ perforation and chronic pain. You might be eligible to join an active vaginal mesh lawsuit for products liability against a medical device manufacturer. Learn more about how to find and work with a transvaginal mesh lawyer. Transvaginal mesh is a medical device that has a long, storied history of health complications. Far too many women had them implanted for stress urinary incontinence and pelvic organ prolapse before researchers learned about the risks involved. Now the medical device community is facing the legal backlash of vaginal mesh lawsuits for failing to anticipate what their products might do. Who qualifies to participate in a vaginal mesh lawsuit? Vaginal mesh lawsuits are, at their heart, products liability lawsuits. You will likely not be pursuing a medical malpractice claim against your surgeon unless there was gross negligence during the implant surgery or medical malpractice at some point; the real problem is with the implant itself. Also, keep in mind that not every woman who has received a vaginal mesh implant will qualify for a lawsuit. An attorney will want to know whether you had transvaginal mesh surgery or bladder sling surgery, and when that surgery took place. Sometimes lawsuits only focus on products made between certain date ranges. The lawyer will also want to know the condition that caused the implant to be inserted and what your transvaginal mesh complications were post-surgery. The side effects are numerous for these types of surgeries, though only those that are clearly tied to the implant will be listed in a lawsuit (for instance, chronic low back pain might indeed be caused by the implant, but that is a nebulous condition caused by any number of things). Enjuris tip: Duane Priddy, CEO of Plastic Expert Group, says, “I can't, in my wildest imagination, imagine anybody that's knowledgeable in the science of plastics ever deciding that it was appropriate to use polypropylene in the human body.” Read more in his interview with 60 Minutes about gynecological polypropylene mesh. Women have experienced far too many complications regarding these implants, and mesh lawsuits are reflecting that. As of 2011, the U.S. Food and Drug Administration had received upward of 4,000 complaints regarding transvaginal mesh procedures during the previous six years. The FDA has not taken a cue from other countries and banned them but instead wrote a warning on their website, reclassifying the devices as Class III (high risk). Three countries have issued bans — or are in the process of doing so — on the sale of transvaginal mesh implants. As of December 2017, Australia and New Zealand halted the sale and use of them entirely, while the United Kingdom is currently discussing the merits of a ban after its top watchdog group, the National Institute for Health and Care Excellence (NICE) said that it was unacceptable to wait until 2019 to stop distribution. Meanwhile, a BMJ Open study discovered that 61 vaginal mesh devices on the market did not even go through clinical testing. And those aren’t the only problems; according to JAMA Surgery’s December 2015 issue, out of all the women who had a vaginal sling inserted for stress urinary incontinence, approximately one in 30 patients will need an additional revision surgery in less than 10 years. 2017 study states 61 transvaginal mesh devices did not undergo clinical trials. Research regarding complications produced varying results; between 7% and 21% of patients have experienced problems with their vaginal mesh implants. When patients experience conditions like organ perforation or mesh erosion, they will likely need more than one surgery to fix the issue. However, these implants were mostly designed to stay in place, encouraging tissue growth. This means that removing them can be extraordinarily difficult, because tissue and blood vessels root the implant in one spot. The implant must be removed piece by piece during as many surgeries as is necessary. As we mentioned earlier, vaginal mesh lawsuits are products liability cases. A case against your surgeon would be for medical malpractice, an entirely different area of law. It is highly unlikely that the problem is with your surgeon, though. The active cases for mesh are a series of products liability lawsuits, so if you want to join a case, it will be for those issues. Design defects: Even a perfect product can endanger the end user if the defect was part of its design. A product is unreasonably dangerous if it does not perform as expected when used in the correct manner. Manufacturing defect: Even if the product were designed to be safe, the end result was not. If that product then causes an injury to its intended user, the manufacturer can be held liable. Failure to warn: Also called “marketing defects,” these focus on the supply chain. The product was properly designed, but it was not accompanied by the correct instructions or warnings. This made the product unreasonably dangerous to its intended consumers. A defective mesh implant would most likely be a manufacturing defect, since the end product injured the user. However, an attorney would also include one or several “failure to warn” claims as well. This means that the manufacturer did not provide proper warnings or instructions. 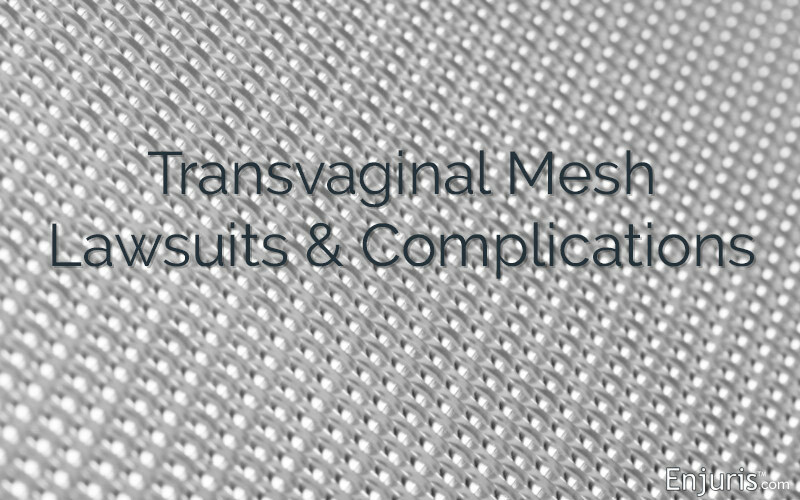 In a transvaginal mesh lawsuit, there are several aspects that must be addressed, such as exactly which companies produced the mesh, where in the supply chain things went wrong, who implanted it, and what health problems they caused. This will result in endless discovery. That is why many women join multidistrict litigation that is already in motion; MDLs are often confused with class-action suits, but there are many key differences. There are currently no class-action lawsuits regarding transvaginal mesh implants. There was a class-action in 2015, filed by Federal Insurance Company against Caldera Medical Inc., but the deadline for any individual claimant to join the lawsuit was May 2, 2016. However, that doesn’t mean there aren’t any cases to join; an MDL is preferable to a class-action suit anyway, because the awards tend to be larger and attorneys retain more control. MDLs consolidate similar cases for discovery purposes and ensure there is no duplicative evidence presented. This saves everyone involved a lot of time and money, since so many of the cases will present the same style of evidence and are against the same defendant. These consolidated federal cases can be joined together from all over the country, though once discovery is complete (pretrial motions, depositions, etc. ), the individual case is sent back to its original court for trial. So, for instance, if you filed your case in the federal court closest to you, the Judicial Panel on Multidistrict Litigation (seven appointed federal judges who oversee all national MDLs) might hand down a transfer order, instructing you to consolidate with hundreds or even thousands of other cases — just for pretrial purposes. Your attorney might also make the strategic decision to join one without prompting from the JPML. The same judge will hear the evidence from all of the cases in the overarching lawsuit, and then once pretrial proceedings are complete, your case — along with any rulings from the MDL judge — will go back to your local federal court to finish up. There are many active multidistrict litigation cases that women can join if they have had severe transvaginal mesh complications. Approximately 100,000 vaginal mesh lawsuits are pending before Judge Joseph Goodwin in West Virginia, though many have settled, gone to trial or have been dismissed. As of November 2017, more than 40,200 individual mesh lawsuits were still pending. In February 2012, the U.S. Judicial Panel on Multidistrict Litigation consolidated cases against three companies in the Southern District of West Virginia. By June 2017, mesh manufacturers had already paid out billions because of allegations surrounding their products. Ethicon was the only company that managed to win a defense verdict in a mesh lawsuit. Meanwhile, at least 18 cases in the West Virginia MDLs have been tried, settled, put on hold or dismissed. In 10 of those big trials, transvaginal mesh plaintiffs have won verdicts totaling more than $49 million. Hoo daisy, yes you do. Products liability lawsuits are complicated, especially those that involve medical devices. There will be expert testimony, lots of depositions and mountains of evidence. Meanwhile, the manufacturer isn’t going to take this without a fight. They are going to put up as many roadblocks as possible, dragging out the process and making you lose hope. Find a transvaginal mesh attorney who has fought these battles before. Let them take the brunt of the weight. How do I join an active transvaginal mesh lawsuit? You first need to hire a lawyer who handles transvaginal mesh lawsuits. Your attorney can file a motion to transfer your case into an existing MDL, which would save money on pretrial aspects of the case. The Judicial Panel on Multidistrict Litigation can also order you to transfer into an MDL if they deem it proper and if there are common questions of fact in your case and the ones already in the MDL. See more on hiring a mesh lawyer below. This means that you will be talking about your most intimate medical issues in depth with anyone who asks about them. It will likely take a few years to finish the case, and during that time you will be deposed (put under oath and asked questions by opposing counsel about your condition). If the case proceeds to trial, you might be called to testify. Joining a lawsuit means having lots of patience and knowing that you will have to discuss your private problems in open court. At the very least you will go through independent medical examinations, which are essentially doctors’ appointments with a medical professional chosen by the defendant. These are designed to be stacked against you by their very nature. Do I have to pay to bring a lawsuit? Not usually. Lawyers generally take a third of the proceeds, plus costs (filing, copying, etc.). That might increase if you go to trial (a normal number is 40% in that instance). This is the understanding that personal injury attorneys have: They put the money up front and gamble on a client. See more on lawyer fees that may be good to know before bringing a transvaginal mesh lawsuit. What can I expect as compensation in a vaginal mesh lawsuit? No attorney can tell you exactly what you might receive. All they can do is provide a range, telling you which clients got X and how many got Y. Some cases go to trial and a jury awards damages; others settle prior to a verdict. Those settlements have reached $20 million for a single plaintiff, such as the one against Ethicon (a subsidiary of Johnson & Johnson). However, other patients have had their claims dismissed for lack of evidence. It is truly all over the spectrum, and nobody can predict what you might get. Will joining a transvaginal mesh lawsuit impact my doctor? Filing a case for products liability can feel like a betrayal to your surgeon. You might really like that person. However, you need to do what’s right for you, and if your surgeon sees that your implant is problematic, he or she should support you. The surgeon will almost definitely be called as a witness, which is obviously inconvenient. At the end of the day, though, it’s the mesh implant that’s troublesome, not your surgeon. He or she should understand that. The first thing you should do is speak with your surgeon if you are feeling pain or discomfort at your mesh implant site. There is a possibility you can rectify the issue without surgical intervention. The imperative is to resolve your pain and make sure the implant is not eroding. Enjuris tip: If your surgeon recommends transvaginal mesh surgery, ask whether he or she has also successfully removed mesh if problems have arisen. If so, how many times have they done it? Second, find a transvaginal mesh attorney. Many women feel more comfortable with a female attorney, as these cases involve intimate areas. You can also start with a Google search along the lines of “Florida vaginal mesh attorney,” where you substitute Florida for your state. You can also get a specific as your city, such as “Tampa vaginal mesh lawyer.” This will help to narrow down your results, since just Googling “mesh implant attorney” will result in thousands of hits. How do you know if an attorney is good? Well, first read online reviews to weed out lawyers who don’t feel right to you. Then, once you have shortlisted 3-5 attorneys, talk with them in person. You can interview each one and decide if he or she is appropriate for your vaginal mesh lawsuit. Remember, each state has a statute of limitations (the time window in which you can file your case). Once that window is closed, you can no longer file. A few states only offer one year for cases, so you should act fast. An attorney will be able to preserve your claim and help you bring a vaginal mesh lawsuit. Products liability law is quite specialized. You need a lawyer who has years of experience and knows how to coordinate with pending multidistrict litigation cases. If you have not met with a transvaginal mesh lawyer yet, look through the Enjuris directory for someone in your state who can assist you in this complicated process.